After topping the Oricon charts with nearly 51k units on the first day, Itano Tomomi clinched the #1 spot in the Oricon Weekly charts with her 2nd single [Fuini]. With a total of 90k units sold, [Fuini] hasn't sold as well as her debut single [Dear J] (which sold 163k units in the first week, just for comparison). 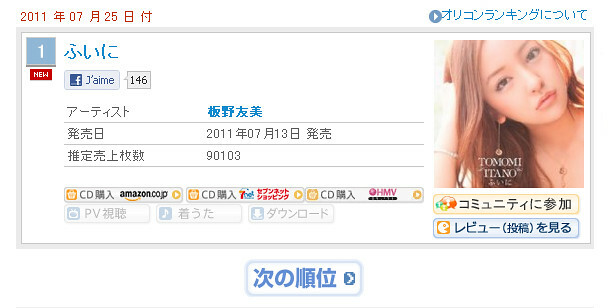 Despite this, [Fuini] is in fact Tomochin's first number one single, so congratulations are in order!! The lower sales are likely in part due to some tough competition with so many recent releases, including fellow AKB48 member Maeda Atsuko's much-anticipated solo debut. Moreover, the style and feel of Fuini is a significant change from Tomochin's debut single, aiming for a more mature R&B love song style. I actually think this is a very strong single, but there's a lot of personal preference in there. Overall, sales were still strong, and Fuini has been selected to be featured in a CM for Samantha Thavasa (who incidentally styled Tomochin's outfits for this single).